No building is properly conserved if it is not structurally sound. Consequently architects, engineers and conservation officers need an adequate grounding in the technology, the materials and the historic origins of the building in order to complete a conservation project successfully. Structural Design in Building Conservation deals with design issues and technical choices, showing how they are integrated with the planning and architectural outcomes in a conservation project. It brings together theory with current conservation technology, discussing the possibilities of structural details and strategies in architectural expression. Case studies are central to this, and these are organised around such themes as the addition of roofs, requalification of space, strengthening and re-use of fabric, repristination, additions, completions, stiffness adjustments, and the correction of past mistakes. The reader is encouraged to examine the technical details of these real projects, and explore the possible solutions. The philosophy of structural interventions is introduced in the context of conservation theories and practices in various European countries. The main types of strengthening, repairs and interventions are explained using different building types, and the structural nature of the main elements to be strengthened (linear structures, frames, plates and shells) is explored in detail. Case studies included cover a very wide range of historic types and conversions, not only monumental masonry structures like neoclassical buildings, major temples, churches, public buildings and museums, but also more utilitarian structures like historic mills, early reinforced concrete structures and vaulting types. 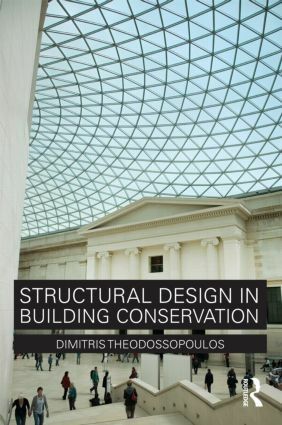 This is essential reading for all students of architectural conservation, and practicing architects and engineers who are involved in conservation projects.